I’ve been meddling with the popcorn again. Last time, the event was New Year, this time it is the return of the Great British Sewing Bee. Very unusually, both my sisters and me were round at our Mum’s for a child free evening (if you count my nephew and niece asleep upstairs) while we nibbled on chocolate and wine … and popcorn. 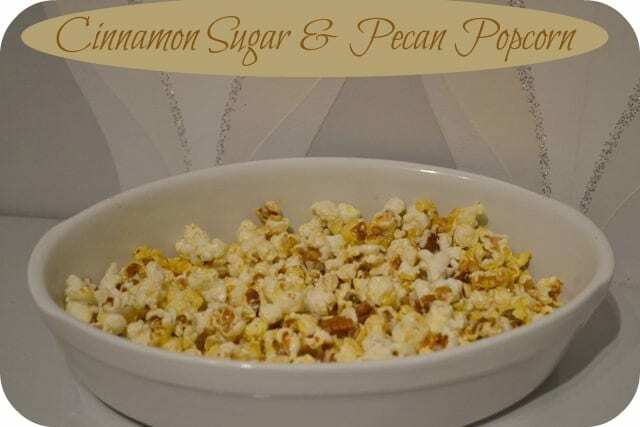 I’ve been wanting to make Cinnamon Popcorn again for ages but wanted to add some extra texture – My trusty bag of Pecans that I always have in the baking cupboard came out to play again. I’m always a bit wary of using buttery popcorn recipes – I think you have to eat them quite quickly before the butter goes stone cold and makes the popcorn too soggy. The trick is only to use a small amount of butter and add gradually making sure it is well spread throughout the corn. Keep on the heat as the kernels pop, until they start to slow down. Its really hard not to burn a couple on the bottom of the pan but you will get used to it with practice. As soon as the corn has stopped popping, transfer to a large bowl and add the butter bit by bit – making sure you evenly distribute it. Not every kernel will be covered. Sprinkle the sugar/cinnamon mixture throughout the popcorn and mix in the pecans. Thoughts on the Sewing Bee so far … I’m not sure anyone stands out as being quite so experienced as last year’s winner, Anne. The lady that pronounces every 5 minutes that she doesn’t pin to the pattern, gets on my wick a little but this could be the fault of the production team making more of it. I suspect the poor man that fell ill, knew he was out of his depth and likely to go this week anyway. I’m no sewing expert but the first task seemed quite simple and standard to me – wouldn’t that be one of the garments that you had a trial run of before entering the show? I never cease to be amazed at how little people prepare for these things….Its like going on the Bake Off without every making a meringue! What are your thoughts? Did you just love it, Jen? I heard an interview with May & Patrick this afternoon where they mentioned that there didn’t seem to be a clear winner from the start. Very exciting! Great popcorn recipe, I love the cinnamon and pecan flavours. I have to admit, the combination came about due to having not much else in the cupboards! Try it – its possibly the easiest recipe ever! I love popcorn and pecans yum!